Ferdinand Porsche diseñó variantes con la torreta montada en la parte delantera y en la parte trasera. El carro nunca entró en la producción en masa. It has a thicker frontal armour than its brother, the E-75. It carries the same gun ordnance, but the VK 45.02 (P) Ausf. B has a slightly better gun reload and handling accuracy (but worse gun depression) thanks to its turret stats. The transmission is located in the middle, which prevents engine damage from frontal hits, but there is a driver port (albeit small) on the front, and thinner sides. Thus, angling the tank is an absolute must in order to survive. Due to the rear-mounted turret, this tank may seem harder to play and more unwieldy than the previous VK 45.02 (P) Ausf. A. 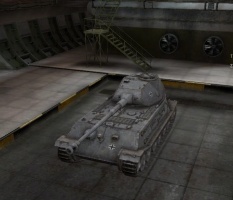 It's certainly slower than a fully upgraded E-75, mostly due an overwhelmed 875 hp engine, but give it time and get used to its unique playing style and you could easily find yourself playing a part in tipping the battle in your team's favor. 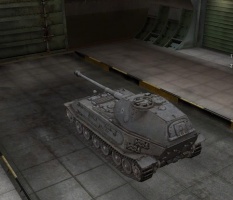 The VK is very heavily armored tank, even more so than the E75, however this comes with some trade offs. The Vk is a serious departure from the Vk 45A, which were more of a medium hunter. The VK 45.02 (P) Ausf. B however is very heavily armored, being able to bounce most tier 9 guns and even some tier 10 guns will have problems penetrating. 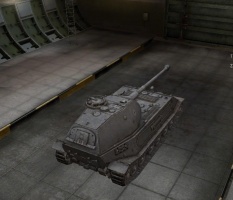 The VK is a brawler, getting into medium or close distance is where this tank belongs. Avoid open areas as it is only the front armor that is strong. Further more staying in open areas will allow light and medium tanks to circle it as the track traverse is rather poor. When driving VK 45.02 (P) Ausf. B you will be able to lead the assault if you plan it correctly. so that you will always have all enemies in direct front of you. This will allow you to take shots for your allies. Don't be afraid to forward positions, but always keep artillery in mind, as they can be the bane of this tank. The only real weakspot on the VK is the cupola which is rather small, and hard to hit. Very precise shots can hit the gunners port too, but that would be quite a feat to achieve. The Ausf. B can make great use of sidescraping techniques due to the rear mounted turret, but not as much as one might think as the side armor is quite weak. In some cases, the learning curve can become fairly expensive and you may suffer heavy financial hits until you've grown (or groaned) accustomed to this heavy tank. Don't give up. The grind can be horrible, you can't mount the best turret and neither the tower until the tracks have been researched. The stock turret is only somewhat strong on paper, and almost everything the VK meets will penetrate the turret, especially the roof is paper thin. Added to that the canon from its predecessor which had poor penetration at tier 8 is utterly useless at against most tier 9 and close to all tier 10. If mastered, the Ausf B. can be a rewarding tank to play and is great preparation for the playing style of the Maus. Two prototypes of this vehicle (one with the forward-mounted turret and the other with the rear-mounted turret) were designed by Dr. Ferdinand Porsche, but it never entered production. This tank, named the VK 45.02 (P) Ausf. 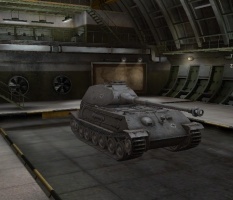 B in the game, is based on the prototype with the rear-mounted turret. The forward-mounted turret is represented by the VK 45.02 (P) Ausf. A. Additional information can be found at: www.achtungpanzer.com.